Fun to read and play with the story. when i try to update this app it doesn't recognize my apple id. All my other (200+) apps recognize it fine. Its not a huge problem, it just forces me to cancel an action multiple times, but it's annoying. The artwork has a Victorian look and is positively sumptuous. But more than that, EVERYTHING is interactive. Things wind up, pull out, are sometimes removeable and can roll around the page... There's so much to discover and explore; and the illustrations are works of art. Bravo! But now the sound won't work. I can't find the settings section to troubleshoot it. Is it on mute? Who knows? My daughter loves this book, but it is tiny on the iPhone. She keeps accidentally swiping the wrong things because it is so small. Holy moly - does it HAVE to be 600MB in size? How about running some jpg compression software or something. Bought for my 7 year old granddaughter. She hasn't seen it yet, but I'm impressed. Great recreation of the old, classic story. And I think she'll love exploring all the touchable objects. I'm saving the fifth star for her vote. I really want to like this app. 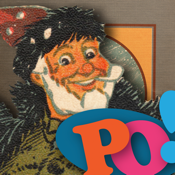 It's a classic story, it's beautifully executed, and the interactive parts are fun for all ages. Unfortunately, it crashes. A lot. And when I say a lot, I mean A LOT. I bought this on my iPad 1 last night, and the app literally crashed on page six. After that, it crashed about every other page. I bought this for my son who really enjoys interactive books, but you can imagine how frustrating it was for him. At one point, the same page crashed literally four times in a row. We had to skip that page in the table of contents and move on. The Night Before Christmas is a short story, but it crashed at least fifteen times while we were trying to read it. The frequency of crashes is so high, that unfortunately I can't recommend this to anyone. This pretty much mirrors my experience with Loud Crow's version of A Charlie Brown Christmas. It's beautiful, and I want to like it, but it just crashes too much. If they could solve the crash problems, these would be first-rate apps. To further compound matters, their tech support is seemingly non-existent. I e-mailed them November 27th. I received a canned auto-response the same day, but nothing since then. I sent a follow-up message that didn't even get an auto-reply. Wow, this is impressive, and the quality is exceptional! I highly recommend. A beautiful story, that has captured the wonder of a book. Why aren't all iPod or iPad books like this? No crashes on my iPod. It is a very nice book to sit down with your kids and read it to them. The spring effect is nice, but it is everywhere .... becomes old news after a while. The voice is really great, the graphics are nice. It feels like the old books our parents read to us. This is a really great blend of old-fashioned illustration and modern tech. Well worth the price. I absolutely love this app...and I am a grown-up! The illustrations and sound effects are adorable. The narration and background music are just right, very relaxing. True to the original and with a charming old school pop-up book realism. And at 99 cents this Christmas it's a steal! A must download this season!!! Make more I'll buy them all!!! This app cracks me up. 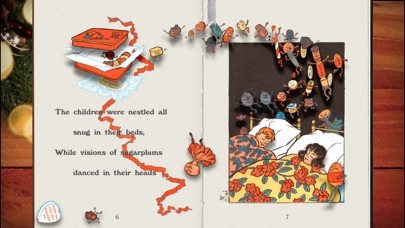 It has great artwork by Denslow, and just about anything you touch will make a sound and move. I love the poem and had a great children's book of this story when I was a kid. I was trying to remember how the whole poem went, and then found it in the app store. This app combines old and new and is really fun. This is one of those neat apps that make you glad you have an iPad. Well my toddler loves highly ( bright and bold colors) animated books. This one did amuse and hold both our interests. Although truth be told- I think I might have enjoyed it a bit more than my child. :). A must have for the Christmas traditions. This is a great book. I is old fashioned which I like but gives kids of all ages the flavor of old Christmas . I am so enamored by this app. This is truly creative detailed and fun!!! This app is amazing. It is so clear LoudCrow understands how to use the technology of iPads and iPhones to make a stunning and highly interactive app. I highly recommend this. I even had fun playing with all the interactives in this really well-done book. Really one of the best Christmas books I downloaded for my family over the holidays. I highly recommend it! 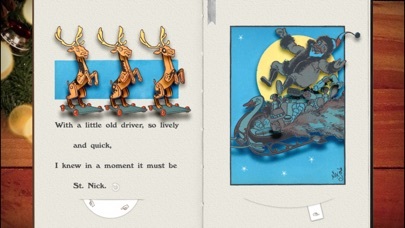 Night Before Christmas interactive "book"
A Victorian Interactive Storybook. We Enjoyed it very much and we're even able to figure out the tabs. I've had this book for several years and my son loves all the interactive items in the story. The narrator has a wonderful voice and is so pleasant to listen to. One of my most favorite purchases! Everything about this book is excellent. The illustrations are wonderful, the animations and sound effects are creative, the narration couldn't be better and the music is perfect! The sound has stopped working. On all four LoudCrow apps. 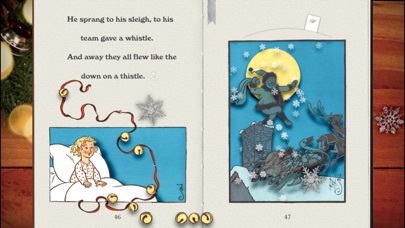 Best Twas the Night Before Christmas Interactive Book Out There! This is the best application I have bought in any of the children's classic stories ever! 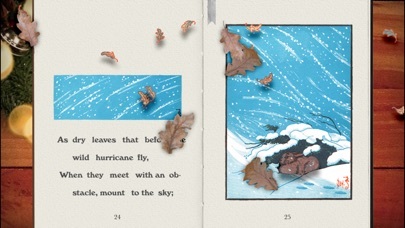 The story was correct, the interactive touching of the screen to touch everything and even hear the sounds, and actions actually transcends you into the book itself, and for adults you will thinking,Wow!, I feel like a child again, and for the adults reading this classic to your children, or grandchildren, well the app will speak for itself. Make sure you touch everything on the page as the story is being read, as well as movement of objects for everything is done in such detail. I would like to see more from this developer. I would buy books without hesitation from the developers. I also wanted to mention the illustrations are amazing, and they transcend you as well. Well done!!! A MUST BUY! This poem/story is my all time favorite Christmas tale and THIS APP is the MOST fantastic thing ever!!! I just bought the other 3 apps by this developer, please please bring more!! My favorite part is the snowflakes, amazing!!! LOVE LOVE LOVE 20 stars!! This book TOTALLY fascinates my twin 4 year old girls. The 3D animations are so realistic the kids don't want to me to advance the pages. This app demonstrates the great potential of the iPad as a powerful learning and entertainment tool. Also, the publishers are very responsive to helpful comments. Buy it! I'm a 74-year-old grandfather to adult grandkids. So this poem has been a great tradition. I am still amazed at all the uses of my iPad when reading this. I wish my Christmas poem had this developer. I am torn, as this is our new favorite version of the story but unfortunately it takes up a very large space on my iPad-i have no idea how they got around this in the app store but the file size is nearly 4x what it states! Maybe for your average user with a 16 GB iPad this isn't a problem, but I am an educator with other specialized communication apps that are naturally space hogs, and your app puts them to shame with its ginormous file size. Fix this and you will have a winning app! I will likely have to uninstall this, as I am having trouble updating other apps due to this space hog, sadly. The story is beautifully done! Denslow, the illustrator, drew this version of the tale in 1902, long before Coca-cola ads gave us the modern rendering of Santa Claus. For those of you who don't want anything other than what you're used to, don't buy this app; for the rest of us, it's a rare treat. 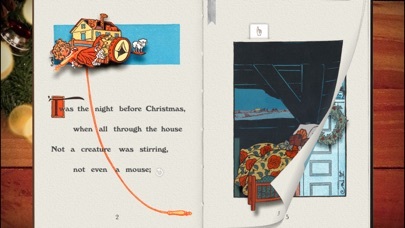 The app works just as a pop-up book would have in 1902, only with the addition of sounds, and items that roll, pop, or jump across the page. i loved it, especially since I'm a fan of early 20th century art. I would recommend tihs for anyone who likes early illustration, Christmas stories, popup books, or who has children or grandchildren. This isn't a video game, people, and it's not supposed to be one. For 1.99, this a a fabulous app and worth a lot more. A great way to read this story! My 4 year old loves all the interactive features and we had fun discovering what each of the pages do. Love you loud crowd! What a fun app! Runs great, lots of little interactive things to touch/pull/slide. Didn't see how to have the pages read at first as it is a little small on the ipod/iphone. Figured it out soon enough. This is an impressive testament to the blend of modern convenience and whimsical stories of yesteryear. As a 27 year old man, I still every 24th of December read the Night before Christmas. This year I took a chance and purchased this product instead of reading the traditional book that I have done for so many years. Instantly impressed by the graphics, I was even more enthralled by the interactivity. I hope to see more pop-out books in the future. Waiting for more books! Just bought all 3! Coloring was not bright and graphics were not appealing. Child did not want to see the complete book. Very disappointing!